If you are a kid of the 90's, you would remember Powerpuff Girls. My siblings and I used to watch it at Cartoon Network and my favorite was Bubbles! Because she's so darn cute hihi! When I saw the cartoon was available on iFlix, I immediately showed it to Y and introduced it to her! Haha! She likes Bubbles as well, she really is my daughter! The crime-fighting trio are back! Better, bolder and braver than before! 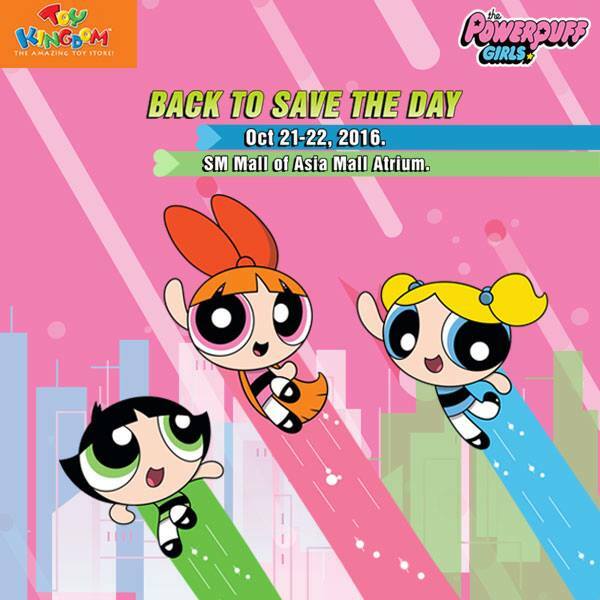 The re-launch of the Powerpuff Girls is happening this weekend, October 21-22, at SM Mall of Asia Atrium! It's the grandest and upscale launch of the Powerpuff Girls! Take the whole family for a fun and action-filled weekend with lots of activities lined up for your kids and kids at heart (and I mean you, my fellow mom who loved Powerpuff Girls! heehee!) at the Powerpuff Townsville where sugar, spice and everything nice all belongs. Put your your maze- solving skills to the test with the Catch the Villain activity, unleash your inner Buttercip in you at the Buttercup Mini Training Grounds and enjoy delightful Power-up popcorns and cotton candy treat. Get the chance to defeat their nemesis at the Mojo Jojo Obstacle Track. And finally, get to design your own Powerpuff merchandise like shirts, and bags and more!. Get up close and personal with Bubbles, Buttercup and Blossom live on Saturday, October 22, at SM Mall of Asia Atrium, 4PM. The Powerpuff Girls range of toys are exclusively distributed by Richprime Global Inc. and they're available at leading toy stores and Department Stores nationwide, prices start at P299. Get to know more about their products by visiting their official Facebook, Richwell Club and website www.richprime.net.